In April 2015, Terrance Kellom was murdered by an ICE agent who was part of a seven-member unit called the Detroit Fugitive Apprehension Task Force. You’re in good company if the name of this “task force” brings to mind the slave patrols of earlier centuries. Agent Quinn claimed he shot Kellom because Kellom threatened him with a hammer. None of Terrance’s fingerprints were found on the hammer, only his blood. We recall thinking at the time of this revelation that the cops had probably just pulled the hammer from the trunk of one of their own vehicles—it’s well documented that law enforcement officers are adept at doctoring their own murder scenes to massage public opinion against the civilians they’ve killed. Cops manufacture and plant evidence, and they plant weapons near the bodies they’ve executed. We’ve read it in court documents; we’ve even watched it on YouTube. Or maybe they found the hammer in the Kellom home, and saw an opportunity to build another fiction with it. 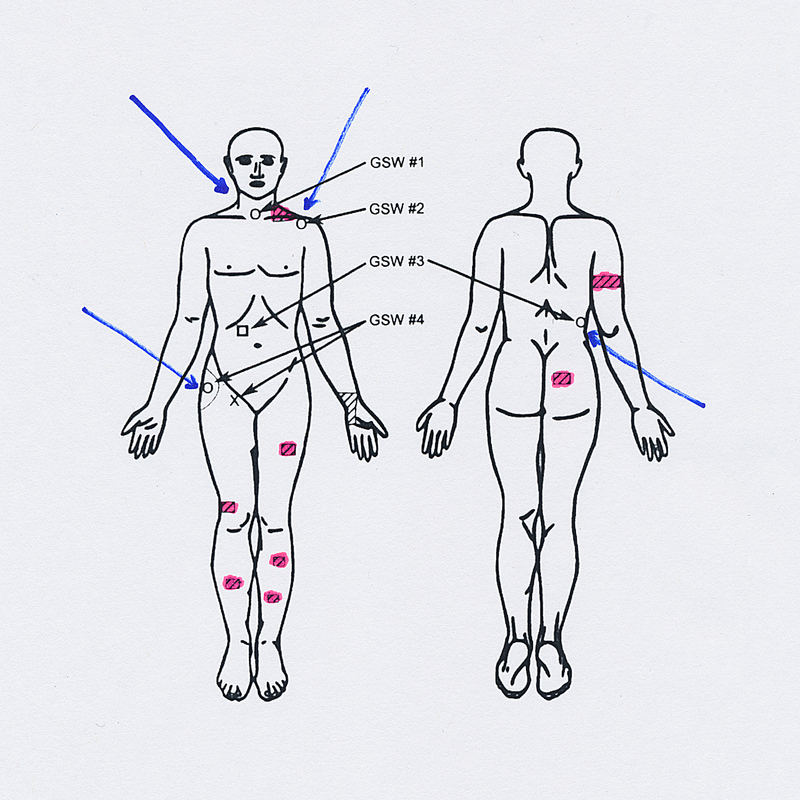 Kellom was also covered with abrasions (marked here in pink). “My son was assassinated in my face. I will never forget that day,” said Kevin Kellom. We believe you, Mr. Kellom. We’ve believed you from the beginning. We know that Freddie Gray was murdered by a rough ride; we know Aiyana Stanley-Jones’s grandma never tried to wrestle a gun from the cop who murdered her granddaughter; we know Aura Rosser never charged two cops with a small kitchen knife, one of whom—David Ried, the one who killed her—has recently been promoted to Sergeant of the Ann Arbor Police Department (note, though, they’ve misspelled his name on this command staff listing); we know Eric Garner was murdered with a chokehold; we watched Milton Hall get executed by firing squad; we know Laquan McDonald did nothing to provoke his murder by a CPD lynch mob; we know Clifton Lee Jr. was asphyxiated by Washtenaw County Sheriffs; we know David Ware was running away, unarmed, when a YPD officer shot him in the back and killed him. We know, in short, that a majority of all police killings—since the invention of police—have also been unprovoked, unwarranted, and unjustifiable.